After a massive snow storm in West Hartford a hotel experienced a massive pipe-break. A main sprinkler system pipe broke on the top floor pouring gallons of water every minute that passed into the hotel. The water spread down to all five floors in the building and created so much humidity that a mold disaster broke out soon after. SERVPRO immediately dispatched their team and brought 100 dehumidifiers, 200 air movers, and 53 air scrubbers to carefully dry every room to avoid spreading mold any further. This local church in Waterbury, CT had experienced some smoke damage from a fire in the neighboring store which was a dry-cleaning company. 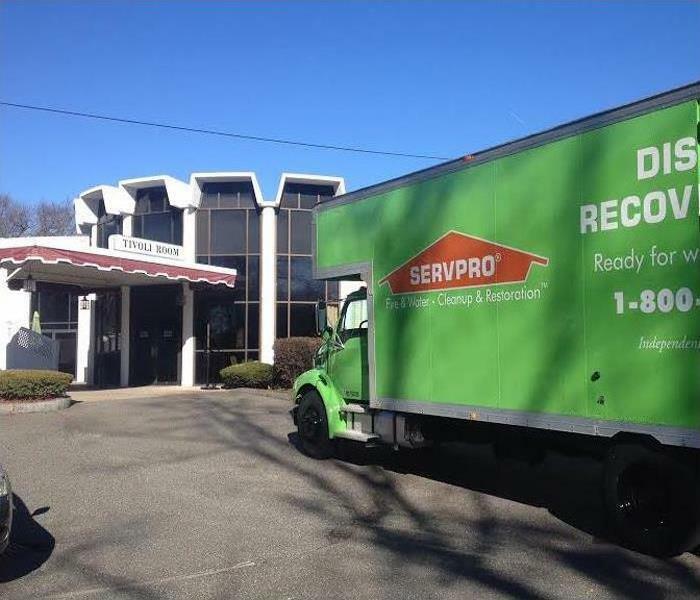 Luckily the fire did not spread too far and SERVPRO was happy to help the church along with the other businesses that experienced any damage done from this disaster as well. 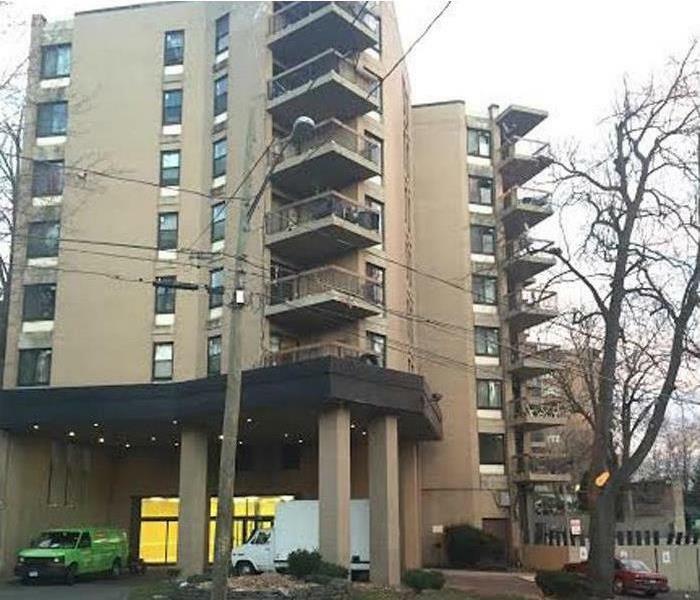 Goodwin Hotel in Hartford, CT recently suffered major water damage among the top levels of their building where many employee offices are located. In this situation we had to go in and cut two feet of drywall throughout their hallways and bring in a large volume of our high-powered fans to dry everything and remediate any further damage. Everything was renovated in a timely manner and Goodwin Hotel being one of the closest hotels to Xfinity Theatre couldn’t be more thankful for our service. After a recent pipe-burst one of Hartford Hospital's buildings suffered from water damage to at least three levels of the building damaging everything from lobbies, offices, and patient rooms. 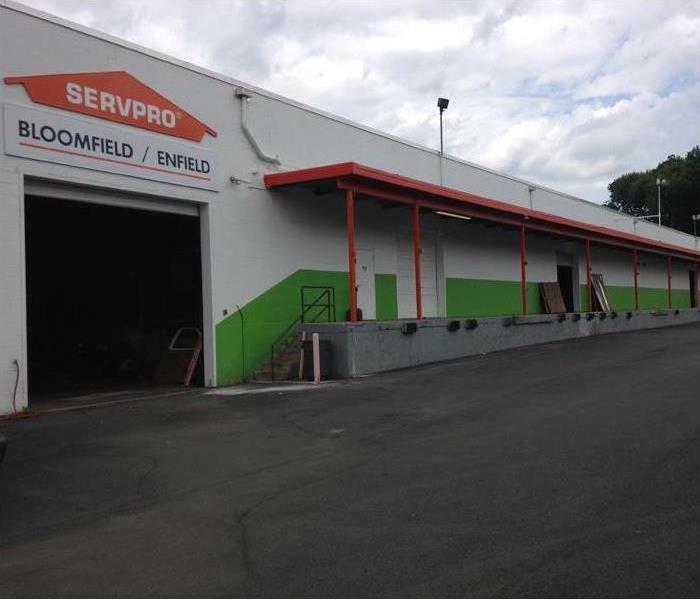 SERVPRO arrived on the scene immediately to help remediate the damage and renovate their facilities back to working order as soon as possible. 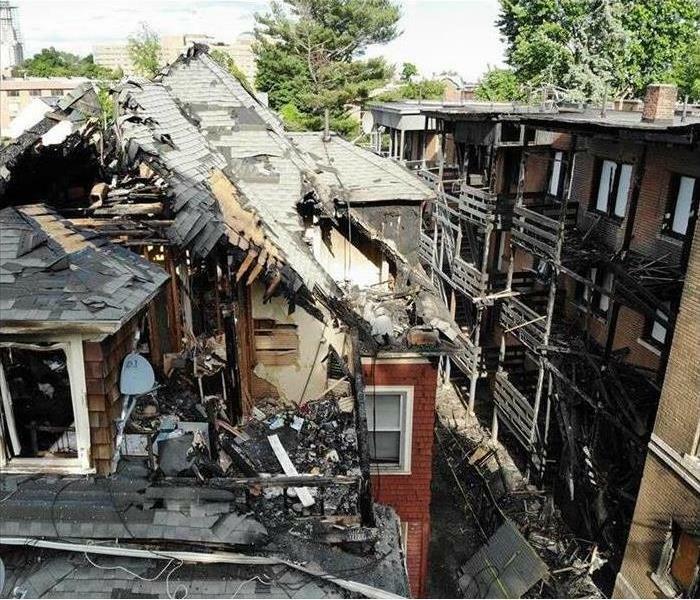 An apartment complex located in Hartford, CT suffered from major fire and water damage. The aftermath rendered the complex's residents homeless. SERVPRO came as soon as the call was made and helped these families return to their homes as quickly as possible. 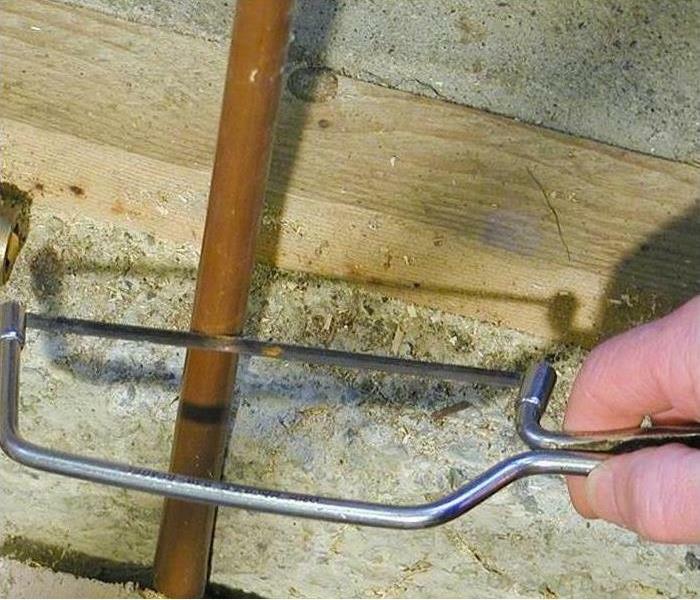 Kitchen pipes are always causing homeowners trouble. This property suffered damage while the owner was away, the entire first floor flooded. 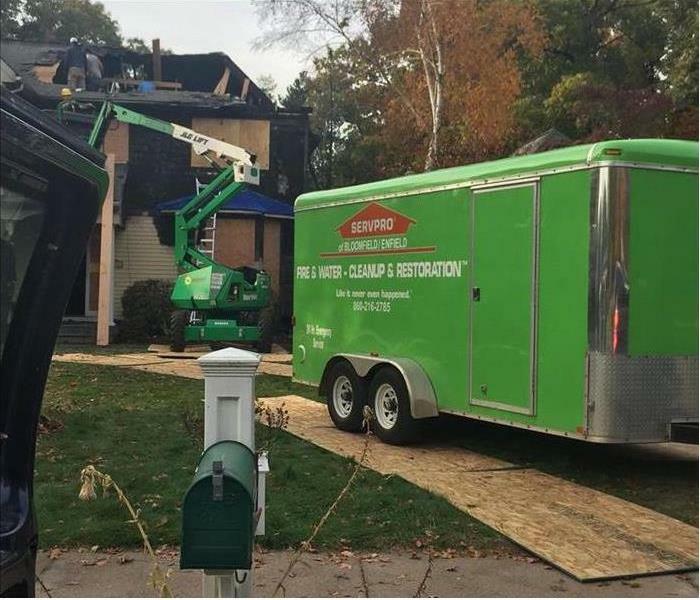 SERVPRO arrived to remediate the damage and restore their home back to how they loved and remembered it. "Like it never even happened." Not long after a couple moved into an apartment, they decided to take down the wallpaper so that they could paint the walls to their liking. To their surprise they found the beginning stages of mold growing underneath where they wanted to paint. Finding more under all the other wallpaper in that room they immediately called SERVPRO of Manchester/Mansfield to mitigate the damage so that they could continue sprucing up their new apartment which seems even newer now thanks to SERVPRO! This couple thought that their paint was just slowly fading away from being an old house. 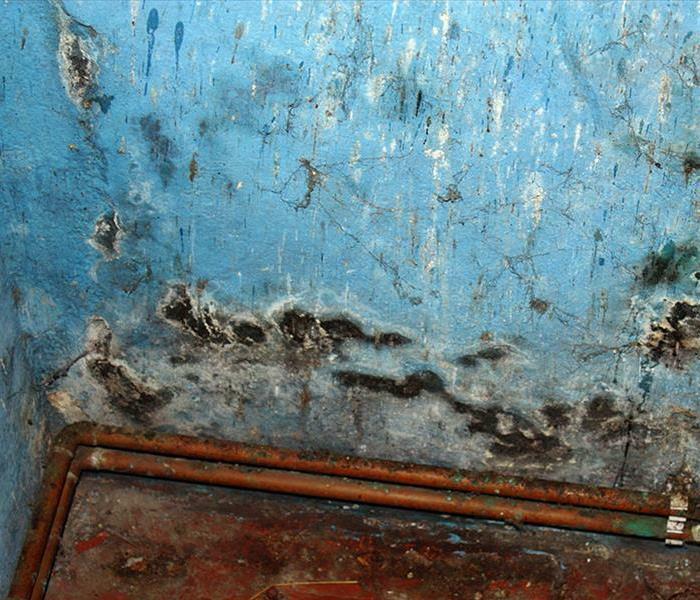 But when one of their friends came over, they had informed the couple that it wasn’t what they thought, it was mold. They felt embarrassed that they failed to identify such a thing in their home. 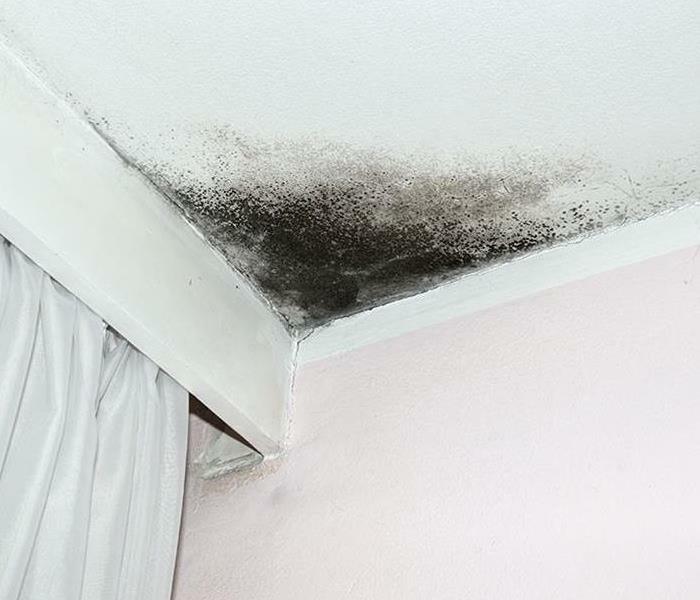 SERVPRO was very understanding to the situation and explained that it happens a lot, many people are oblivious to what mold actually looks or where it could be growing and hiding in a home until it may reach its further stages. There is a reason why some properties are so cheap. After upsettingly purchasing a property this customer’s first concern was tackling the mold buildup in the walls. SERVPRO of Manchester/Mansfield arrived immediately after the owner made the call that morning. They remediated the damage and did a great job renovating the walls and floors as requested by the customer as well. 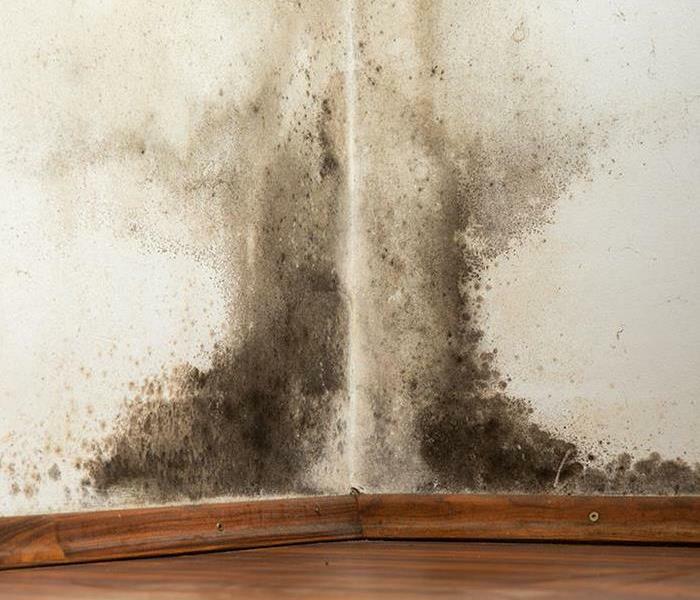 One of the last things people usually decide to replace is the floors, and floors are a very common place for mold to grow. Things get spilled all the time on floors and liquids can easily get underneath and sit there for days which turn into months and then years. When the mold was found SERVPRO came to the remediation rescue and restored the area to a much better condition! 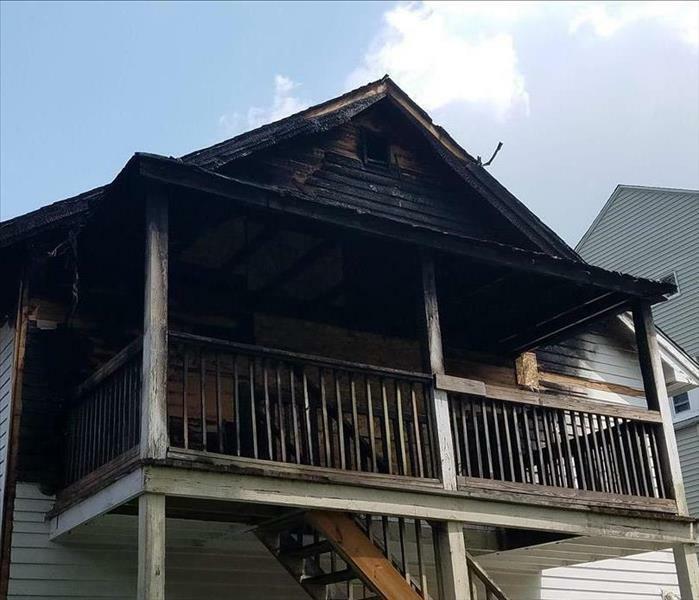 A fire in Hartford CT started on a porch grill and spread through the entire house. SERVPRO came to the scene and saw that smoke had engulfed the entire house. Once the fire was put out SERVPRO boarded up the building then gutted all the walls, ceilings and floors to prepare the house for remodeling. On February 12, 2018 a sprinkler pipe break at a sizable Hartford nonprofit agency damaged about 75,000 square feet of the agency. The agency’s ability to serve clients and keep its employees safe were affected. The agency chose SERVPRO to do all the restoration work. SERVPRO began by performing emergency water extraction of several inches of water. We then completely dried the area with industrial dryers and tested for mold and mildew. Next, we removed and replaced all damaged building materials. During the work we discovered and removed hazardous asbestos and applied an anti-microbial spray. The nonprofit commented on the fast response, professional service, and SERVPRO's ability to safely remove hazardous material. Dozens of people lost their home after a fire ripped through 2 separate multi-family buildings on the corner of South Marshall and Case Street in Hartford Connecticut. The SERVPRO First Responders were on the scene. They spent the whole night and into the next day securing the property and personal belongings from the fire and water wreckage. A Bloomfield homeowner suffered a major water loss behind expensive kitchen cabinets. Standard procedure would have been to cut through the cabinets to fix the plumbing. SERVPRO of chose to save the cabinets by cutting through the pipes below the cabinets. It was a creative solution that cost $800 of repair work to the pipes but saved the newly installed ornate kitchen cabinets that the homeowner said had cost $30,000. 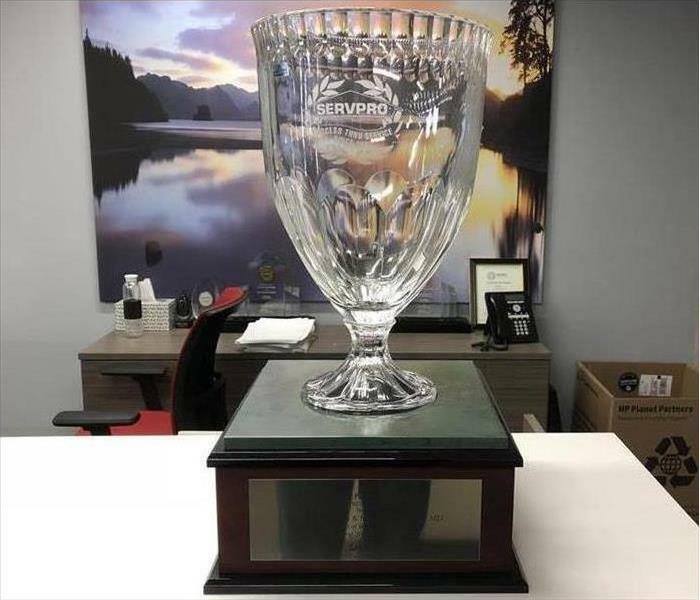 In 2018 SERVPRO of Manchester / Mansfield won the Heritage Platinum Award. 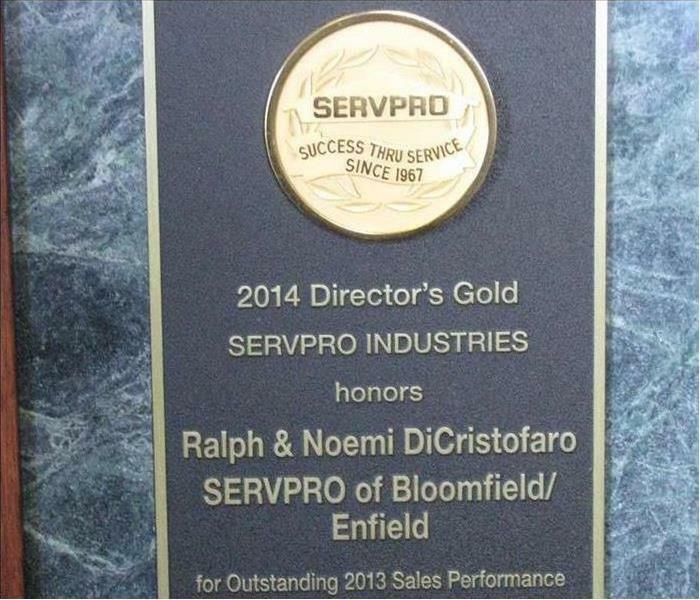 This corporate award signifies that our franchise is one of the top 25 out of the 1800 SERVPRO franchises nationwide. 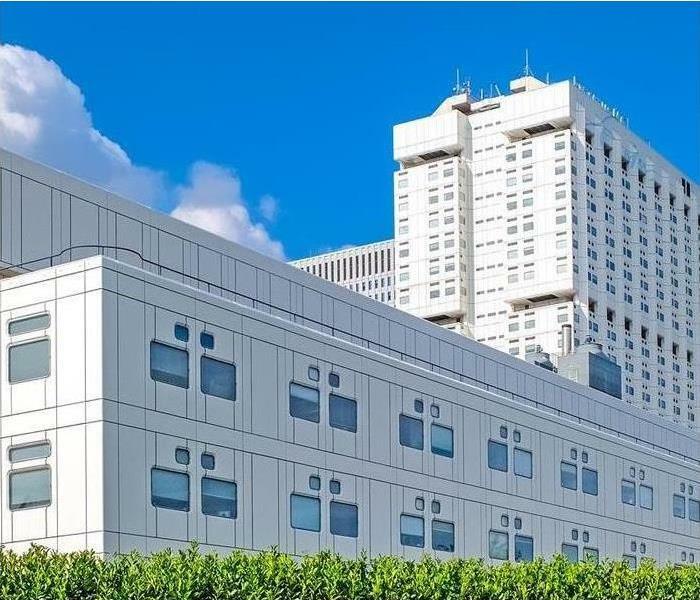 In August of 2018, a sprinkler head broke at a major Connecticut hospital causing major water damage. 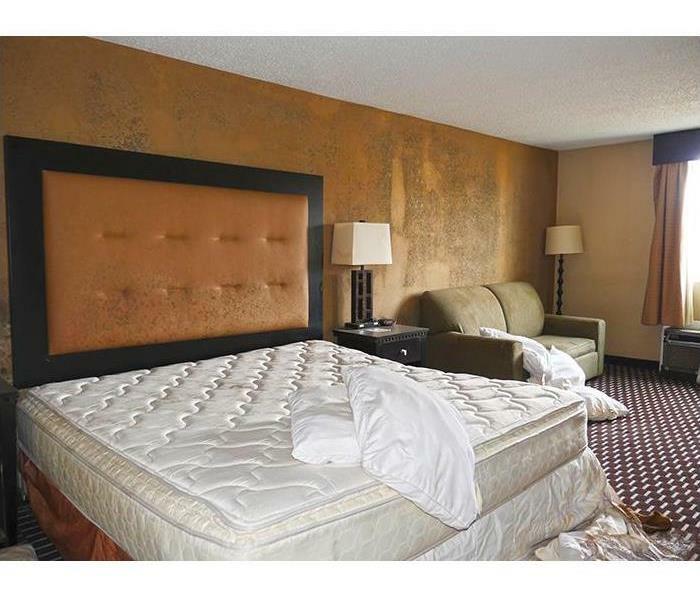 One 3,000 square foot floor was flooded with water and the moisture seeped into the walls. 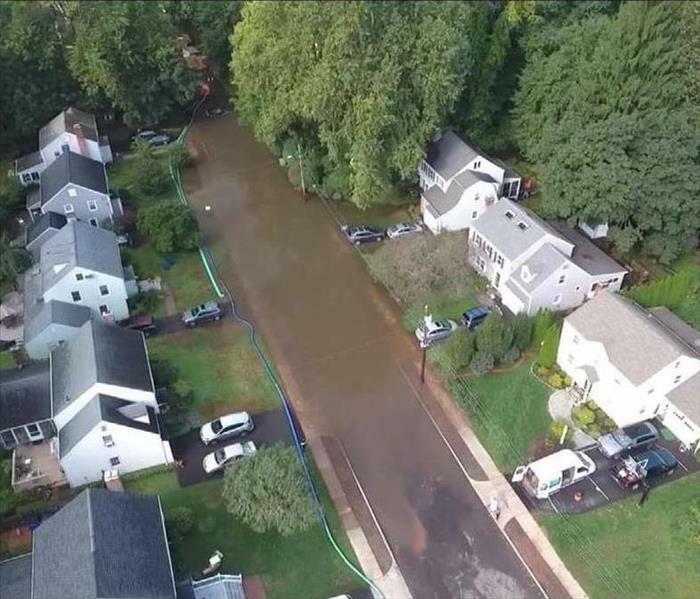 A sewage Pipe clogged in West Hartford spilling raw sewage into the street and filling the basements of many homes in the neighborhood. SERVPRO was on the scene pumping out basements and removing damaged property. Although many homes needed water damage cleanup services all at once, we were able to help them all. No job is too big or too small for SERVPRO of Manchester / Mansfield! Dozens of people lost their home after a fire ripped through 2 separate multi-family buildings on the corner of South Marshall and Case Street in Hartford Connecticut. The SERVPRO First Responders were on the scene. They spent the whole night and into the next day securing the property and personal belongings from the fire and water wreckage. Turning off Electricity and water, boarding up the windows and doors and removing hanging debris from the outside of the building. About 20 residents were displaced, many of them are looking to SERVPRO to salvage what they can from their homes and personal belongings. Most of which lie in a pile of ash and rubble. After any damage situation, your primary focus should be safety first. 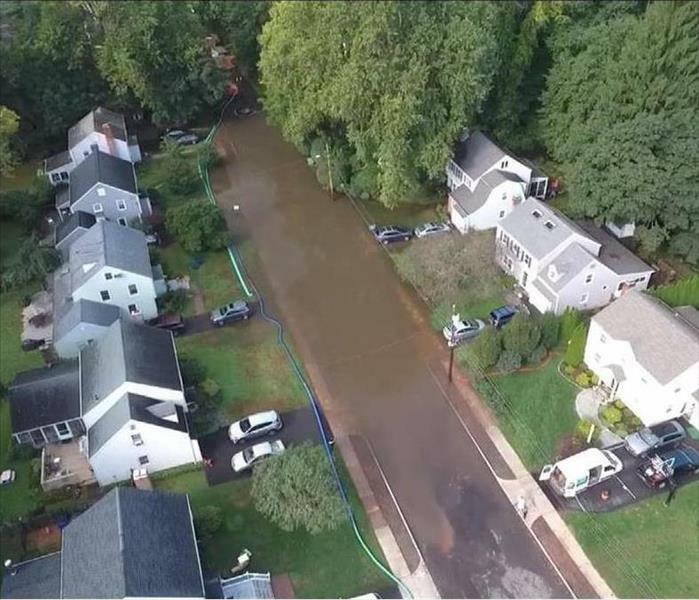 SERVPRO recently used Drone footage to assess the extent of tornado damage to a Hamden CT home. 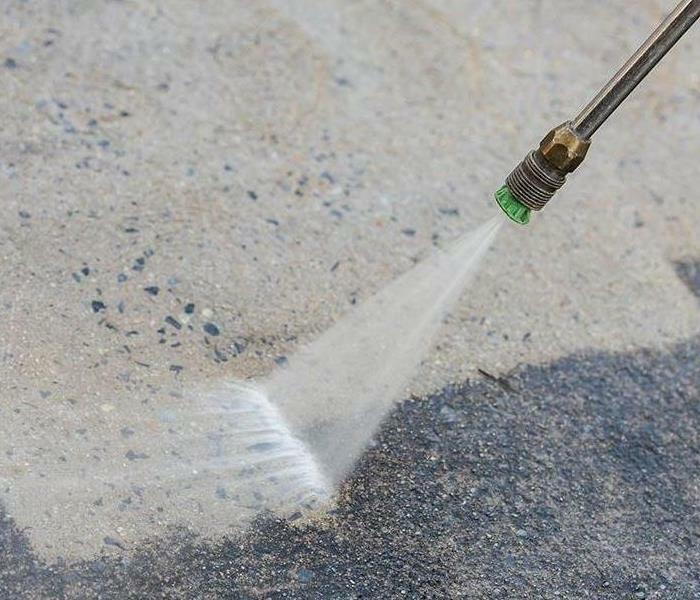 Trust SERVPRO of Manchester / Mansfield to use the latest technologies to clean up and restore your property! 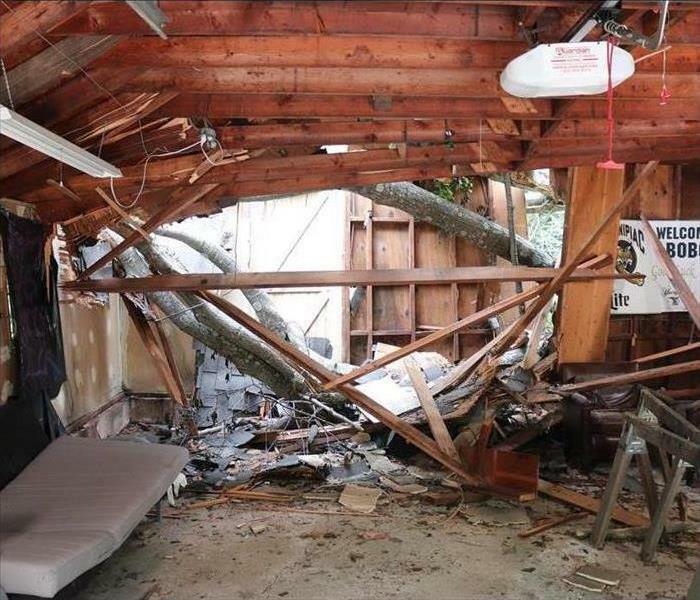 A tree came crashing through a garage in Hamden CT. SERVPRO assisted with tree removal and storm damage cleanup. 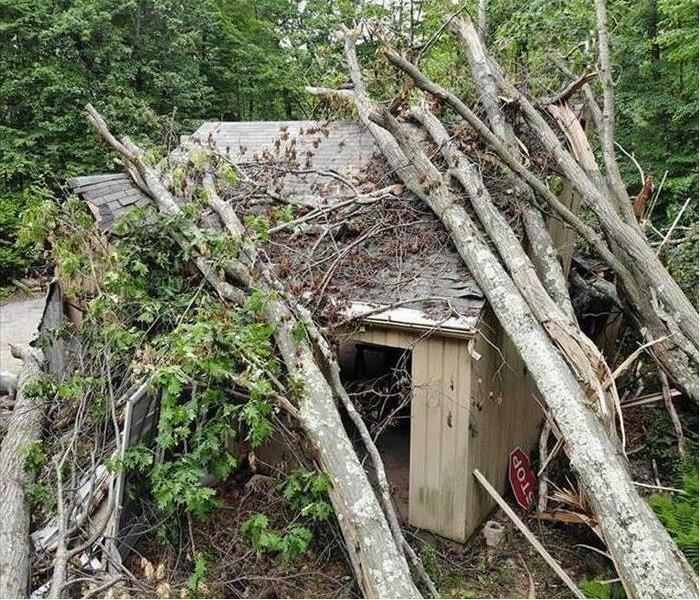 The tree that crashed through this garage was a result of one of three tornadoes that tore through Hamden, CT and two other surrounding towns. 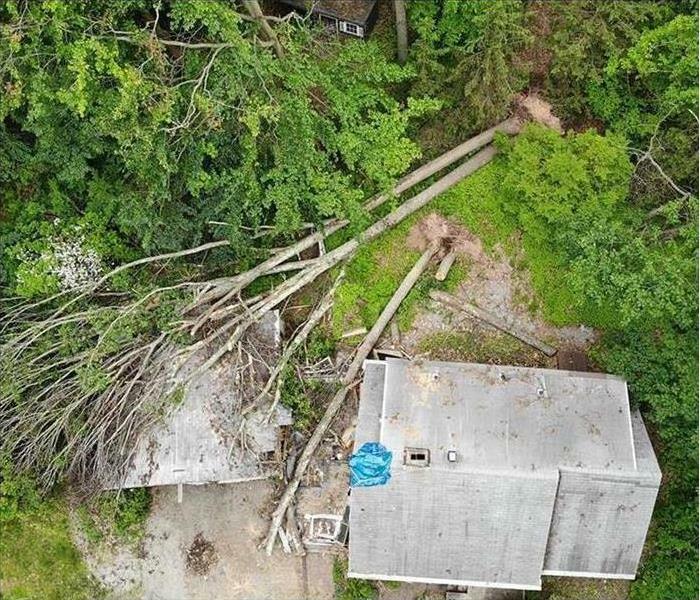 SERVPRO of Manchester / Mansfield came to this devastated storm scene and performed tree removal services to help the homeowner recover from the damage that multiple tornadoes caused from tearing through two other surrounding towns as well. A tornado tore through a Hamden CT neighborhood downing trees and power lines leaving thousands without power. 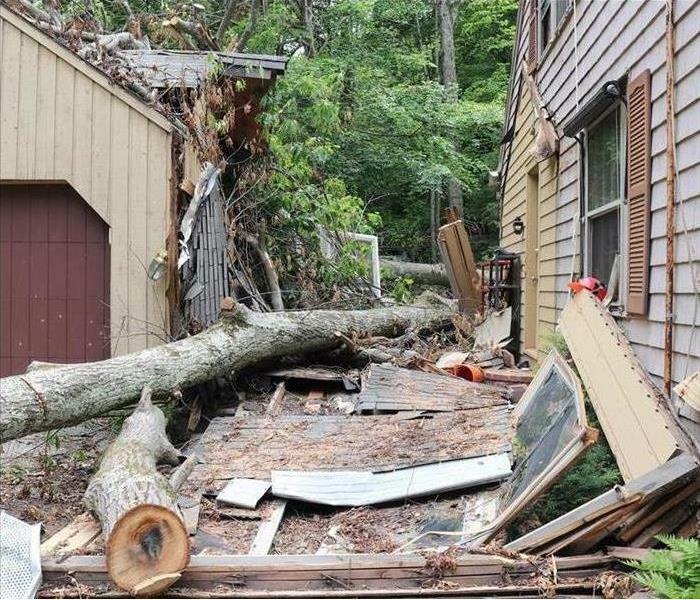 SERVPRO was on the scene to assist this Hamden CT homeowner with tree removal after a group of trees fell on his garage and walkway. The house sustained minor damage but the breezeway was completely flattened. 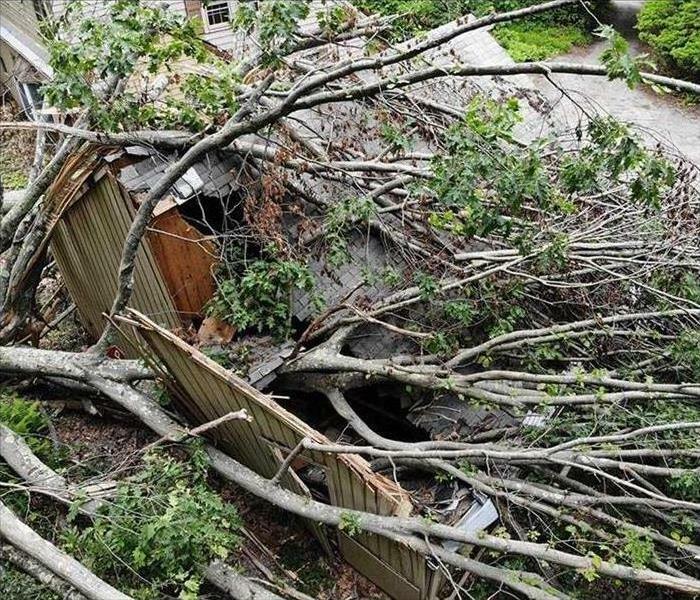 Three tornadoes tore through residential areas in Connecticut downing thousands of trees and Powerlines, some of them landing on homes and vehicles. Many roads were impassable for days, covered with debris. 75% of Beacon Falls lost power. There was damage was everywhere, including a 10 mile swath of destruction to Hamden CT.
Fire Damage at a Windsor home caused a partial roof collapse. We worked with a construction company to board up the roof, windows, and doors and tarp the roof to protect the home from further damage. We are also working with the insurance adjuster on the next steps to restoring the home. Walk into our office and you’ll see a large cabinet to your right. It’s filled with plaques, awards, and certificates like the one shown here. Thank you to all our customers for putting your faith and trust in us. But you won’t find our greatest award in this cabinet. Our greatest award is the thank you and appreciation we receive from you, our customers. A November 2015 fire at the Chez Josef Banquet Hall in Agawam, Massachusetts did extensive smoke damage. We restored three ballrooms, the kitchen, and the entrance way. Because the fire department had to use fire hoses to douse the blaze, Chez Josef also required us to do a dry down of many of the rooms. 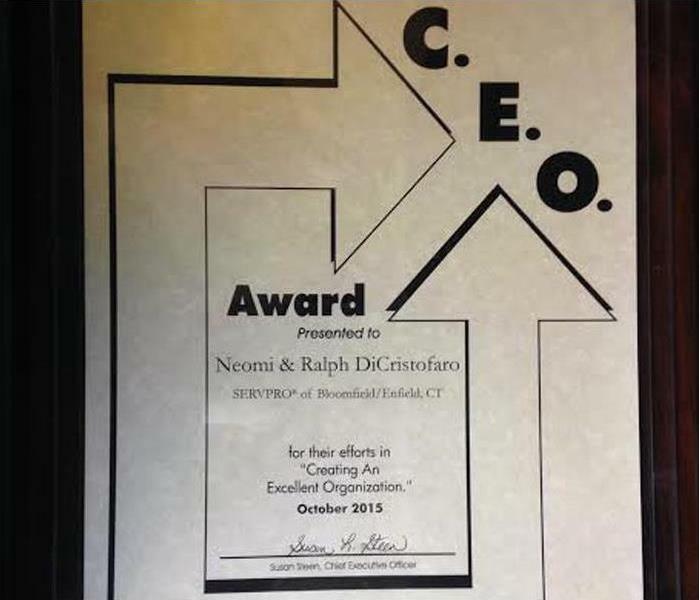 We won the 2015 C.E.O. Award. C.E.O. stands for Creating an Excellent Organization. The award acknowledges offices with an outstanding work environment. 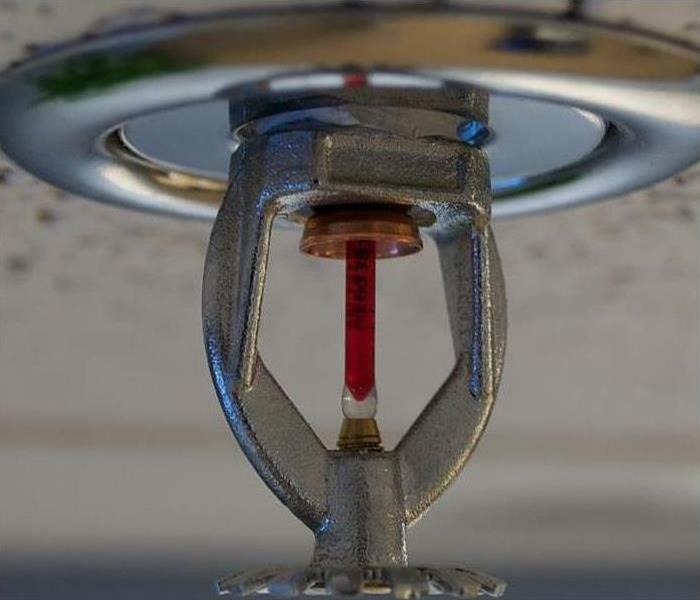 On December 18, 2015 a fire at the Waterbury Apartment Complex in Waterbury, Connecticut damaged about 9,000 square feet in several apartments. We did emergency board up to secure the affected apartments within an hour. We did emergency mitigation to dry out the structure and fire and water cleanup that evening, well ahead of schedule. The property owner said SERVPRO of Manchester / Mansfield is the only mitigation company they will use. 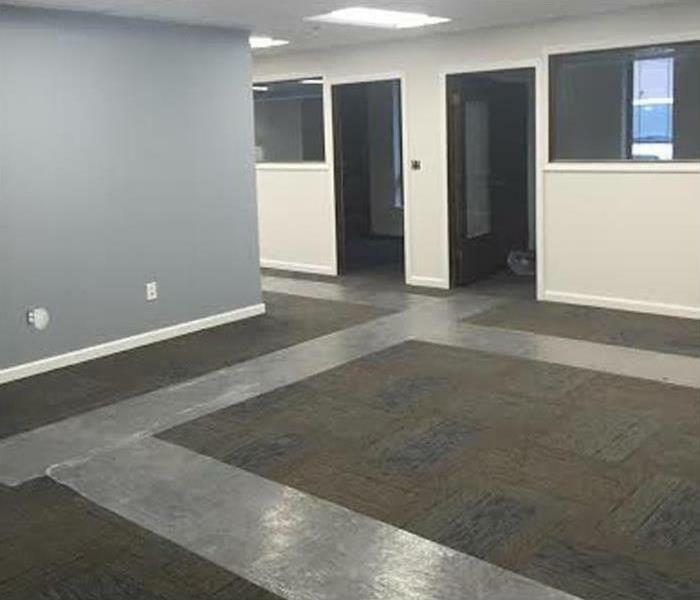 Here's part of the office redesign of our new headquarters at 100 Peters Road, Bloomfield. We're moving in by March 31. Our phone numbers will stay the same. Our new warehouse is five times bigger than our old warehouse. The old warehouse was 10,000 square feet. The new 100 Peters Road, Bloomfield warehouse is 53,000 square feet. Our capabilities to respond faster with more restoration equipment just got much more powerful. 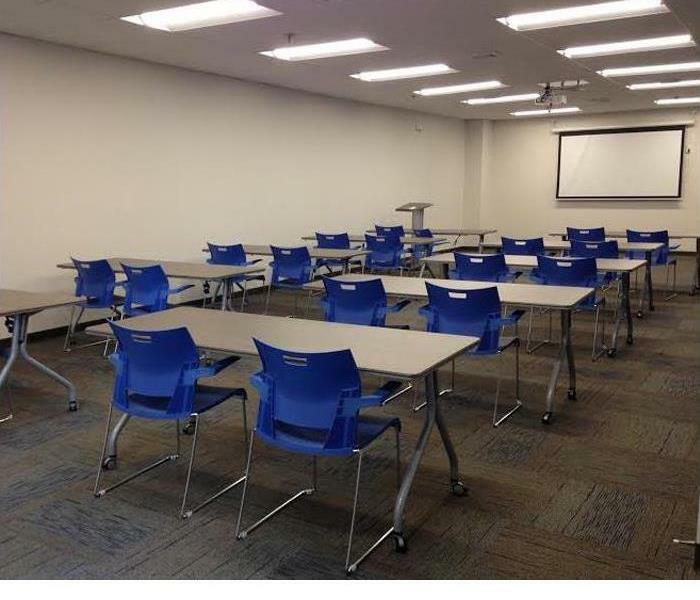 Our new facility at 100 Peters Road, Bloomfield has a brand new conference room that seats groups of 20-35 comfortably. Approved groups can rent it for free. Just call our office at 860.216.2785. 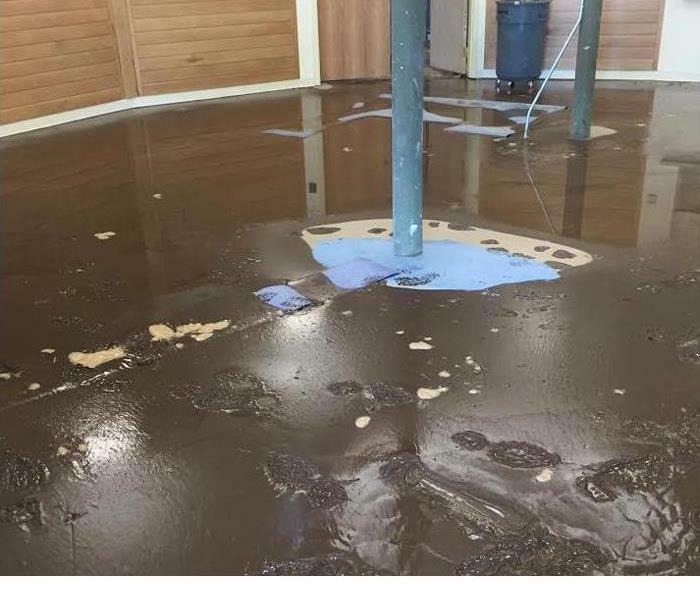 SERVPRO of Manchester/Mansfield did a mud and water damage restoration at a school in Simsbury, Connecticut. We earned the job and several more due to our immediate response, knowing how to best restore the damaged floors, and making it look like nothing had ever happened in just a few days.